Kiddy World Publishing, 9789491882166, 510pp. Frans X. Plooij studied behavioral biology in the Netherlands in Amsterdam, Nijmegen, and Groningen, where he received his Ph.D. in 1980. He is a full member of several international, scientific societies including the New York Academy of Sciences. Together they studied infant development in free-living chimpanzees with Dr. Jane Goodall in the Gombe National Park, Tanzania, East Africa. Dr. Plooij is director of the International Research-institute on Infant Studies (IRIS) at Arnhem, and president of Kiddy World Promotions B.V. Hetty van de Rijt studied Educational Psychology at the University of Nijmegen, the Netherlands and obtained her Ph.D. in Physical Anthropology at the University of Cambridge, England. At the University of Amsterdam, Dr. van de Rijt studied the development of human babies in their home environment. 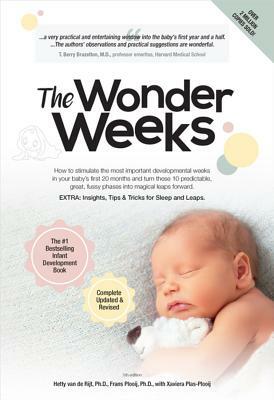 As lead author with her husband as co-author, she wrote the best-selling parenting book The Wonder Weeks, which has been published in twelve languages, from the USA to Japan.Xaviera Plas is CEO of The Wonder Weeks, daughter of Frans and Hetty and a mother of three. After her studies she decided her mission was to help parents by spreading the knowledge of The Wonder Weeks. We want everybody to be able to give their baby... a smart start for a happy beginning!